This is a reworking of the Wikipedia® article in which I define the terms used on the same page and in some detail to make the original statement more readable for people who are less scientifically minded. Feline immunodeficiency virus is a lentivirus that affects domestic, stray and feral cats worldwide and is the causative agent of feline AIDS. From 2.5% up to 4.4% of cats worldwide, and about 2.5% of cats in the USA,are infected with FIV. FIV differs taxonomically from two other feline retroviruses, feline leukemia virus (FeLV) and feline foamy virus (FFV), and is more closely related to human immunodeficiency virus HIV. It is an endemic disease in domestic cat populations worldwide. Feline: Of or belonging to the family Felidae, which includes the lions, tigers, jaguars, wild and domestic cats; felid. Felidae: the biological family of the cats; a member of this family is called a felid. Felids are the strictest carnivores of the sixteen mammal families in the order Carnivora. Immunodeficiency: Immunodeficiency (or immune deficiency) is a state in which the immune system’s ability to fight infectious disease is compromised or entirely absent. Virus: A small infectious agent that can replicate only inside the living cells of organisms. Most viruses are too small to be seen directly with a light microscope. Viruses infect all types of organisms, from animals and plants to bacteria and archaea. Lentivirus: Lentivirus (lenti-, Latin for “slow”) is a genus of slow viruses of the Retroviridae family, characterized by a long incubation period. Causative agent: The term disease causative agent usually refers to a biological agents pathogen that causes a disease. Pathogen: An infectious agent, or more commonly germ, is a biological agent that causes disease to its host. Retroviruses: This is an RNA virus that is replicated in a host cell via the enzyme reverse transcriptase to produce DNA from its RNA genome. The DNA is then incorporated into the host’s genome by an integrase enzyme. The virus thereafter replicates as part of the host cell’s DNA. Retroviruses are enveloped viruses that belong to the viral family Retroviridae. RNA Virus: An RNA virus is a virus that has RNA (ribonucleic acid) as its genetic material. Feline leukemia virus (FeLV): is a retrovirus that infects cats. As stated it is different to FIV. The infection results in a range of “syndromes”. These include leukemia, which is cancerous lymphocytes in the bloodstream and lymphoma (cancer of the lymph nodes). The virus also results in immune deficiency leading to an inability to protect the body and bone marrow suppression (white blood cell and platelet production is compromised), which has the same effect. See symptoms of FeLV. Human immunodeficiency virus HIV: is a lentivirus (a member of the retrovirus family) that causes acquired immunodeficiency syndrome (AIDS), a condition in humans in which the immune system begins to fail, leading to life-threatening opportunistic infections. Endemic: This word can mean “belonging” or “native to”, “characteristic of”, or “prevalent in” a particular geography, group, field, area, or environment; native to an area or scope. There are five FIV subtypes based on nucleotide sequence differences coding for the viral envelope or polymerase. 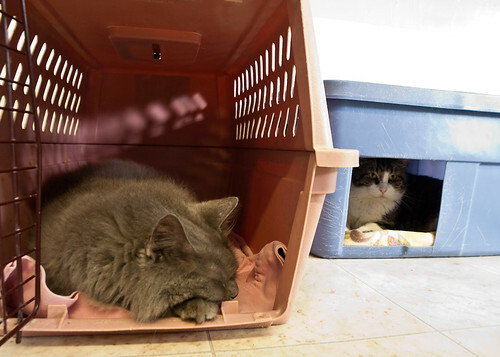 FIV is the only non-primate lentivirus to cause an AIDS-like syndrome, but FIV is not typically fatal for cats, as they can live relatively healthily as carriers and transmitters of the disease for many years. Viral envelope: Many viruses have viral envelopes covering their protein capsids (the protein shell of a virus). The envelopes typically are derived from portions of the host cell membranes (phospholipids and proteins), but include some viral glycoproteins (proteins that contain oligosaccharide chains (glycans) covalently attached to polypeptide side-chains). Is there a Feline Aids Vaccine? A vaccine is available although its efficacy remains uncertain, and cats will test positive for FIV antibodies after vaccination. The development of an effective vaccine against FIV is difficult because of the high number and variations of the virus strains. There are risks and benefits with vaccines. A good veterinarian will advise. Feline aids symptoms: FIV can attack the immune system of cats, much like the human immunodeficiency virus (HIV) can attack the immune system of human beings. There are three stages. First is the Acute Stage (1–2 months after transmission). Second is the Subclinical Stage (4 weeks to X months after transmission). Third is the Chronic Stage, in which cats eventually succumb to chronic infections due to suppressed immune system function. FIV+ rescue cat Goldthwaite at Tree House Humane Society – photo by Alan Chan (Flickr). Feline Aids Treatment: Lymphocyte T-Cell Immunomodulator has a conditional license from the United States Department of Agriculture as a new treatment for Feline Aids and FeLV. Lymphocyte T-Cell Immune Modulator is a single chain polypeptide. It is a strongly cationic glycoprotein, and is purified with cation exchange resin. “It has been shown to increase lymphocyte numbers and IL-2 production in animals”1. Lymphocyte: This is a type of white blood cell in the vertebrate immune system. T cells: or T lymphocytes belong to a group of white blood cells known as lymphocytes, and play a central role in cell-mediated immunity. Immunomodulator: a substance (e. g. a drug) which has an effect on the immune system. There are two types of effects – immunostimulation and immunosuppression. Conditional license: A license to use the drug for a period and under certain conditions, during which it is evaluated. Peptides: are short polymers of amino acids linked by peptide bonds. They have the same chemical structure as proteins, but are shorter in length. Cation: is an ion with more protons than electrons, giving it a positive charge. Glycoproteins: are proteins that contain oligosaccharide chains (glycans) covalently attached to polypeptide side-chains. IL-2: Interleukin-2 is an interleukin, a type of cytokine immune system signaling molecule, which is a leukocytotrophic hormone that is instrumental in the body’s natural response to microbial infection. Feline Aids Diagnosis: Testing for feline aids requires care and includes ELISA, IFA and Western Blot Immunoassay testing. Testing includes a blood test for FIV antibodies not the virus. ELISA: Enzyme-linked immunosorbent assay (ELISA), also known as an enzyme immunoassay (EIA), is a biochemical technique used mainly in immunology to detect the presence of an antibody or an antigen in a sample. 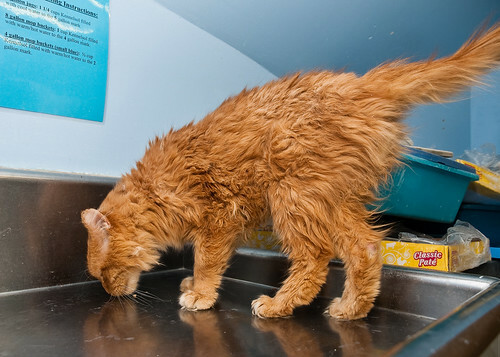 See more here: Feline leukemia test. IFA: Immunofluorescence is a technique used for light microscopy with a fluorescence microscope and is primarily used on biological samples. See more here: Feline leukemia test. Western Blot Immunoassay: Like the ELISA procedure, the western blot is an antibody detection test. However, unlike the ELISA method, the viral proteins are separated first and immobilized. In subsequent steps, the binding of serum antibodies to specific HIV proteins is visualized. The ELISA test is used in diagnosing FeLV cats too. Antibodies: are gamma globulin proteins that are found in blood or other bodily fluids of vertebrates, and are used by the immune system to identify and neutralize foreign objects, such as bacteria and viruses. Feline Aids Transmission: The primary modes of FIV transmission are deep bite wounds and scratches, where the infected cat’s saliva enters the other cat’s bloodstream. FIV may also be transmitted from pregnant females to their offspring in utero. Stray and feral cats are obviously more susceptible to bites acquired in territorial fighting. See also cat abscess. Feline Aids sources: These are almost exclusively from Wikipedia® – verbatim as allowed under license. The reader is asked to go to Wikipedia® for the exact source. Wikipedia® lists sources, unlike nearly all other sites. In addition Cat Owner’s Home Veterinary Handbook by Drs Carlson and Giffin was referred to. All it takes is a little common sense and real knowledge about the virus. Hi Jane. Just did a page. If you want to add a comment and a picture in a comment, please do. Glasgow University Vet School have some definitive research on the subject. Catwork Sanctuary have long provided reliable and sensible information on this virus and how to successfully manage cats who have the virus. Use of the term “Feline AIDS” does nothing but cause hysteria and keep people ignorant of the true nature of this virus. The FAIDS part is only relevant when a cat reaches the terminal stage of the condition and has full immune system collapse. Often people use the term Feline AIDS because they assume that everyone knows what AIDS is because of HIV. Unfortunately, most people are hugely ignorant about HIV too. Thousands of healthy cats are needlessly killed every year by vets and rescues (including RSPCA and Cats Protection) due to profound ignorance about the virus. If you tracked 1000 cats with FIV, 1000 cats without the virus and 1000 cats of unknown status, and determined what killed them, you would be unable to see any difference between the groups in what carried them off this mortal coil. If cats with FIV are well cared for, they live long, normal healthy lives. Please contact Catwork, they will give you some really accurate information about this virus. Thanks Jane. I wrote this years ago and the title is based on search engine optimisation principles. In other words people search for “feline aids”. I take your point. A point well made. Cheers Michael, you are a true friend to cats. Totally agree. FIV cats deserve respect and first class care.